Shirts With Random Triangles: Florida Starting QB Will Grier Faces One-Year Suspension For Violating NCAA Banned Substance Policy. 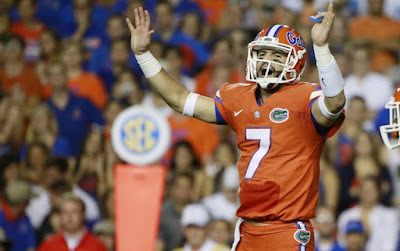 Grier spoke to reporters during Florida head coach Jim McElwain's Monday press conference. He explained that he had taken an over the counter supplement which, which supposedly contained a substance prohibited by the NCAA. "I took an over-the-counter supplement and I did not check with the medical staff before taking it," Grier said. "I really hope that people can learn from this, learn from my mistake. I'm really, really sorry to everyone. Just really sorry." The substance in question had been reported in the media as Ligandrol described by Dr. Saturday's Graham Watson as "a steroid alternative that gives the benefits of a testosterone booster without the side effects of traditional steroids." Other sources are putting that claim in dispute, however. We're told Grier did not test positive for Ligandrol. The Gators have gone 6-0 this season under Grier. The team is scheduled to go on the road to play LSU this coming Saturday.